They sound heavy. How many cores d'ya have and how much RAM you got? VST3 adds a lot of new features to the plug-in format. Reason doesn't support VST3s. My favorite skin for Diva so far is the Volta which I bought some time ago. I saw it in some random forum surfing and I knew she was the one for me. after further investigating, the hog is Repro 5. Repro one seems reasonable (comparable to "The Legend" CPU usage wise) , but the polyphonic Repro 5 is quite demanding ! can anyone confirm that the filter resonance of Repro 1 can not be automated ? Repro is the benchmark for virtual analogue according to my ears. Just blows Arturia away. Hum...yea, uHe can beat as much as it wants. I payed less for Arturia and Soundtoys complete bundles together. So i skip this one. Exactly. The only thing that could be interesting in the next time is Phaseplant from Kilohearts. But i am already sure i wont pay 200 bucks for it. Judging only from the small pool of reactions across the various audio forums, this has been a very popular promotion, with many people jumping on this deal. I'm not even the slightest upset that I bought these at full price because they're THAT good and worth it. DIVA and Repro are some of the best (probably THE best) digitally analog modeled synths out there. The Arturia stuff is great, and I own and use them too, but as soon as you play Repro you can immediately feel and hear the difference. It's a noticeable jump in quality - and there's only one RE, in my opinion, that rivals the "analog" sound of Diva and Repro, and that's The Legend. 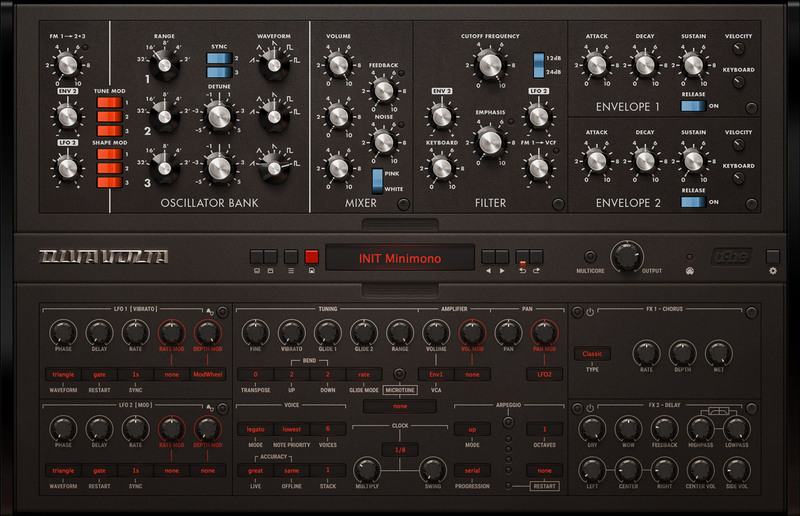 If the analog thing is your THING, and you're not one of those "I only want to use REs just because they're REs" types , then these are the synths you are looking for. Emian wrote: can anyone confirm that the filter resonance of Repro 1 can not be automated ? Not every patch is a CPU hog, and if you want to use the beautiful "Roland" filters on a low voice count, it works pretty OK (I have an older i7 4 core). VK-2 and Expanse can be demanding as well, but as always it is patch dependent - big time. Some Diva patches barely budge the needle (single notes) and some almost hit the ceiling (with a chord). But what is coming with the Reason CPU/VST efficiency update? Well, I ran the same Diva patch and chords in both Maschine (stand alone) and Reason 10.2. Reason sucked up about double CPU compared to Maschine. The right most number is the CPU % usage from Windows resource monitor. Running exactly the same patch and a 3 note chord, both running simultaneously. Now with that being said, that was CPU load and not DSP load. The DSP load difference is smaller, but it is still there, no doubt. Just make sure you also ENABLE multi core on Diva. My DSP meters dropped down to half when I did that and that works in both Maschine and Reason. If Diva still gives you DSP problems, check the patch and its Voices and Stack settings, you can easily cut the DSP load another 50% by doing that so you can continue to work. Then set it back to higher numbers when it is time to bounce. With these two strategies I can get a Diva patch to drop from 100% DSP load to 25%. And with the Reason DSP update that would probably get down to 20%. Sure, lower Stack setting sounds thinner, but it is just a way to continue to work without rendering. As a rough guide to how they'll perform on your system after the optimization update, just download Reaper and see if your system can handle the U-he synths viably in Reaper. I'm my experience I can just pile multiple Repros into Reaper and my laptop just shrugs. Then, for a rough estimate, assume that post-optimization New Reason will be halfway between Current Reason and Reaper, VST performance-wise. I'm gonna estimate "slightly worse than, or about equal to, Ableton Live". thx for the link ! 7 days to go for this sale. Then you'll *probably* never see Dive or Repro at this price ever again. Not even during black friday. There's about a day and a half left on this deal at the time I'm posting this. I picked up the Collection, because I've wanted Satin from when it was announced that U-he would stop making REs. Contemplated getting Diva, but I've got Repro and so much other good stuff - I don't need it. I'm not buying U-He until he fixes the long known bugs in his REs. They're not getting fixed. You can no longer buy them. I don't know if the deal is still on, but I got an email from him when he made the choice to stop RE development. The offer gave me the full set of Ubik VSTs for free, because I had bought at least 5 REs. There were smaller discounts for people who bought fewer than 5. In any case: I’m on a Mac and can’t figure out how to install alternate skins... For some reason I can’t get it to work.